My, what a terrible day to be a Patriots fan. I'll call it "Black Sunday" for the New England Patriots dynasty actually because it's all downhill from here. This is how dynasties crumble. A veteran/aging team is now under the watchful eye of, gasp... Matt Cassel? Cassel hasn't started a game since high school and although he rallied the Patriots together for a win Sunday, the outlook is still very gloomy for the Bill Beeelahcheck and his crew. Cassel looked good against the Kansas City Cheifs and who doesn't? There's rumors going around that New England is already trying to garner the services of one Chris Simms. Yikes. Option two? Tim Rattay. Yeah, all the genius and cheating in the world isn't going to bail the Patriots out this time. 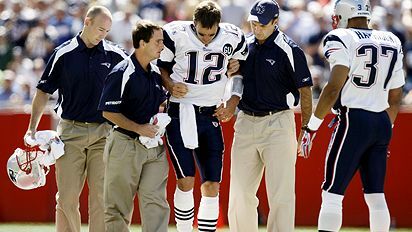 While it still remains to be scene if Tom Brady will return from the devasting leg injury this season, he probably won't be the same. This is the second time he's had a leg injury within the last nine months. In other news, what a day for Chad Ocho Cinco. It was hilarious to read the wire reports actually refering to him by his newly appointed last name. I'd call him Oucho-Cinco or Ocho-Stinko based on his perfomance Sunday in a loss to the Baltimore Ravens. The Cinci Bengals only mustered 99 yards through the air. The wide reciever formerly known as Chad Johnson accounted for 22 of them, on one catch. Way to bring pride to the name on the back of the jersey Chad.